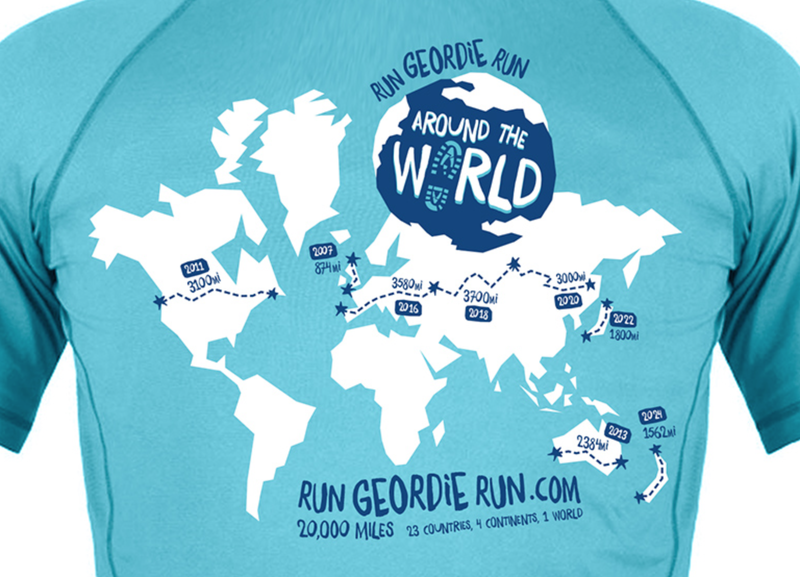 Thank you to everyone who ordered an Around The World Run Geordie Run t-shirt. I'm pleased to report that, after only 8 days on sale, they are now all sold out and have helped the charity fund for the European segment inch over the £3,000 barrier. The run down the UK, across the USA, across Australia and now through Europe as part of the ongoing run around the world would be a complete waste of time without the generosity of so many kind people. Thank you all so sincerely on behalf of The Sir Bobby Robson Foundation and The Children's Foundation. There are a small number of hoodies left in sizes (chest to fit) Small - 36", Medium - 40", Large - 44", Extra Large - 48". With a new fundraising campaign underway, I've been setting up the spreadsheet behind the scenes that I use to reconcile all monies received by the 2 charities. Money tends comes in to the charities from various sources. The majority is via Virgin Money Giving but amounts are also sent directly to the 2 charities. It's very important to keep an eye on it all so that nothing is missed. 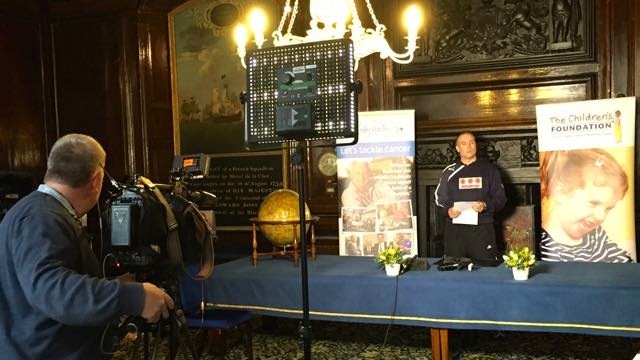 Fundraising for the European segment of the run around the world started last week. I'm pleased to report that the charity fund has got off to a flying start thanks to people buying t-shirts and hoodies and various donations including £500 from SOS Group to get the fund rolling. My own personal fundraising target for the European segment of the run around the world is £50,000. If successful, that means that the overall total (currently at £215,227.40) will burst through the 1/4 of a million barrier and sit at £262,478.40. It's going to take a lot of hard work and generosity to achieve that figure for The Sir Bobby Robson Foundation and The Children's Foundation. The next segment of the run around the world, from Lisbon to Istanbul, is going to be incredibly difficult. There's no doubt in my mind that the bar has been raised after the run across Australia as it was after the run across the USA. That European segment will require an average of 37 miles of running per day for 100 days. That's quite simply unprecedented for me. As are the logistics of the next run. I'm convinced that the general public will once again follow the journey with great interest and will hopefully back me and the 2 charities again. That generosity is something that I never have and never will take for granted. 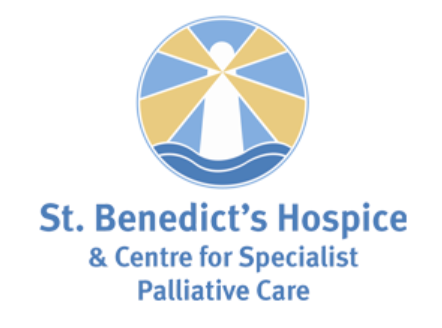 It's this generosity that makes a huge difference to terminally ill people and underprivileged children in the region. Thank you once again if you have sponsored me over the years or bought a t-shirt. There aren't enough words to express how much I, and the 2 charities, are so very grateful for your support. 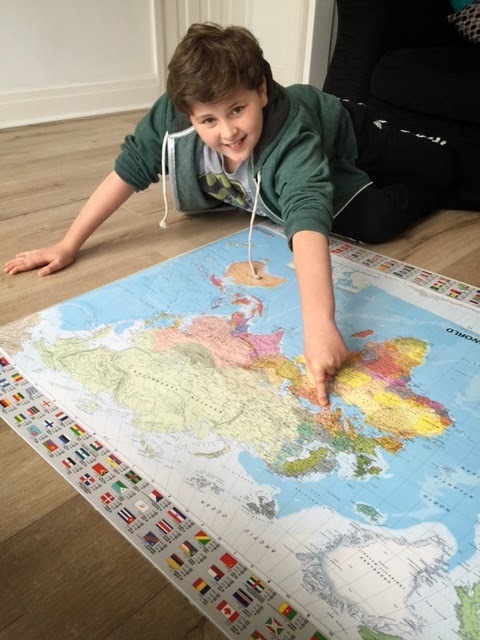 When you tell your son that you're going to "run around the world"
My son, Jack, has been present on the support team from the early days during John O'Groats to Lands End and also more recently during the run across the USA. He's pictured below together with support man Steve Harrison and myself running in Missouri. 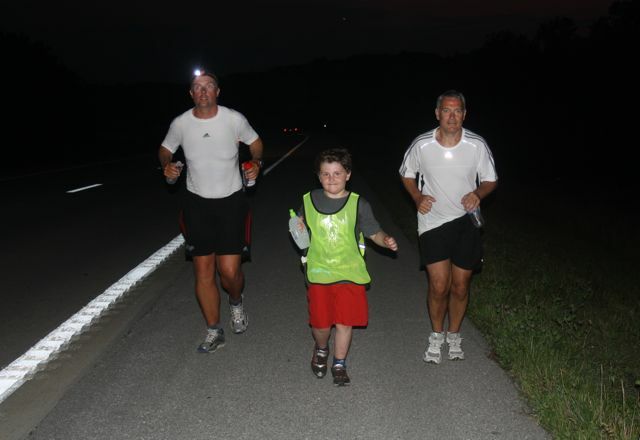 I was always very curious to find out exactly what Jack's reaction would be when he learned of his Dad's plans to run 20,000 miles around the world. It's not every day that you get to break that kind of news to your son! I wasn't surprised that his initial thoughts were for my safety. Wild animals, hydration problems and running thousands of miles away from civilisation in some countries that had seem troubles in the past were his main concerns. Once I sat him down and explained, just like I had previously to the 2 charities, about the route and all that I was doing to make it as safe as possible, his worries eased and soon turned to excitement. He was even more elated when I said that, by the time I got to Japan and New Zealand, that he would be old enough to drive the support vehicle! Running around the world is as much a sacrifice for Jack as it is for me. I'll be spending 1 year and 8 months in total running around the world. Apart from the few weeks spent with Jack on the support team, that is a long time away from him. One of the positive byproducts of what I hope I'm doing, through, is that it sets a good example to Jack. I'm trying to teach him 2 things. Firstly, that you can achieve anything you set your mind to. Yes, it takes a considerable amount of effort, sacrifice, good fortune, support and generosity. But with all of those things, anything is possible. Secondly, that it's important to do deeds in life that are for the good of others. I know that Jack is beginning to understand those important messages. I'm so proud and pleased that he is determined to be present on the support team during the segments in Japan and New Zealand. It is very fitting that my son, who was present with me at the start line in John O'Groats will be there at the finish line in Slope Point, New Zealand. 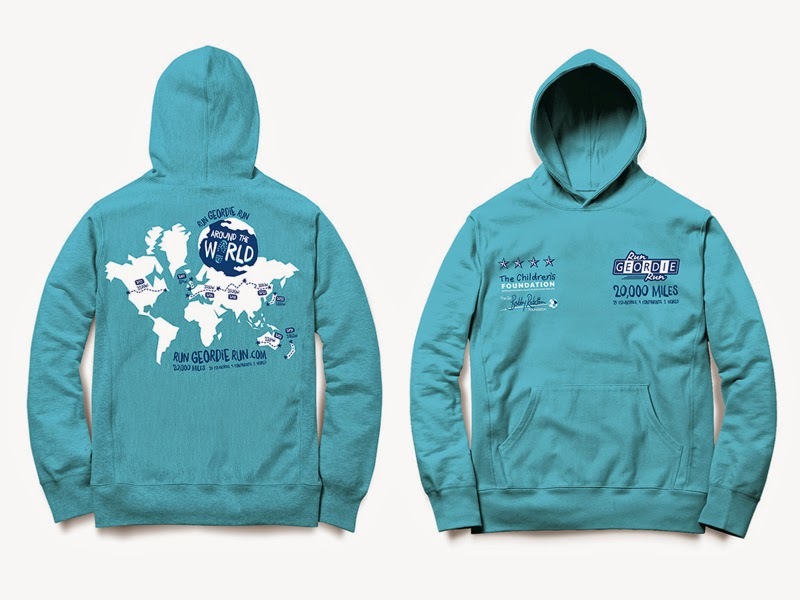 Run Geordie Run Around The World technical t-shirts (£12) and hoodies (£22) are now available to pre order for delivery week commencing 17th November. T-shirt sizes are: Chest (to fit) XS - 35", S - 38", M - 40", L - 43", XL - 45", XXL - 48"
Hoody sizes are: S - 36", M - 40", L - 44", XL - 48", XXL - 52"
Stock is limited and is expected to sell out very soon based on previous sales. Please get your order early to avoid disappointment. The snazzy designs were produced by Dave Shenton of Shenton Creative who gave his services free of charge. Click on the image below to see it in greater detail. The story is finally out there after months of secrecy! I've heard some brilliant coverage on local radio and seen news items on the BBC and ITV Tyne Tees lunchtime bulletins so far. Please tune in to ITV News Tyne Tees tonight at 1800 and then on BBC One (North East and Cumbria) Look North at 1830 where I will be live in the studio. I reported some great news last month about the charity fund for the run across Australia closing at £55,126.60. This gave an overall total to date of £212,478.40. That total represents kindness beyond belief and it's very difficult to express just how grateful I am to the thousands of kind folk who have made a donation in respect of my running events over the years. There was further great news this week as the 2016 charity fund got off to a great start with a £500 donation to The Sir Bobby Robson Foundation and The Children's Foundation from those kind folk down at Smart Office Systems (SOS) Group Ltd* in Team Valley, Gateshead. 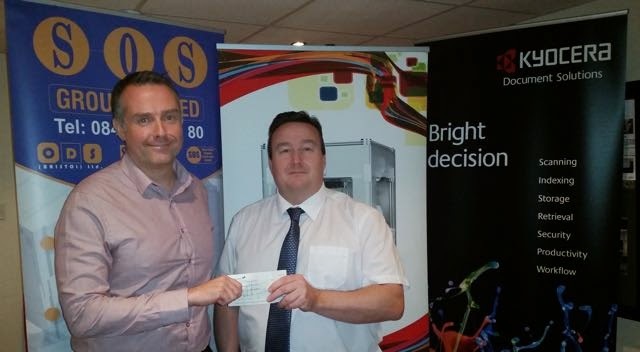 Pictured below is SOS Group Director Andrew Skelton handing over the cheque. The great news didn't stop there as SOS Group said that the main reason for getting me to come down to their premises was to talk about how they could best support me during my 2016 run. I brought them up to speed with my fundraising background, the whys and wherefores and by the time I'd left we had a high level plan to help make the 2016 run a fundraising success. Unlike funds received from my other sponsors for tour costs**, any funds from SOS Group will be wholly used for charitable purposes. 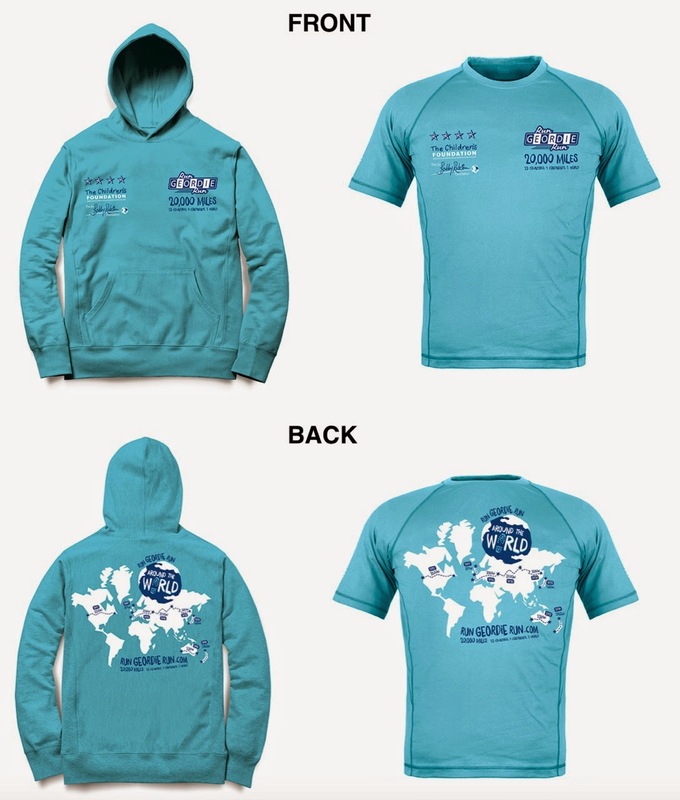 In the first instance, SOS Group will be paying for the production of the new Run Geordie Run 2016 technical t-shirt and hoodie available to pre order from Wednesday 22nd October. This means that all of the proceeds from the sales can go straight to the 2 charities. Absolutely all of it. 100%. For example, if a t-shirt costs £5 to produce, then SOS Group will pay that £5. When the t-shirt then sells for £12 then ALL of that £12 goes to the 2 charities. Therefore, the 2 charities will see a nice return on SOS Group's donation. I get the feeling that that is just going to be the tip of the iceberg and just from the brief discussions we've had so far I feel that, given SOS Group's obvious company ethic regarding charity and community support, that the 2 charities are going to benefit immensely from this partnership. It is for that reason that SOS Group will fit nicely into the 2016 sponsorship "family" and I see the same values in the other kind companies who have signed up to support me. They are all so keen to help and to see me do well in 2016. Andrew Skelton of SOS Group said "I first met Mark a few months ago at the Tyne Metropolitan College Year awards. We were both presenting awards and Mark had shared his recent running experiences with the audience. I sat opened mouth and staggered by the distances Mark had ran and the money he had raised in support of the two great charities. The strength to do the various runs and emotional factors Mark had gone through was very inspiring. At that point I made an immediate pledge of support. In recent weeks we’ve had a chance to talk in more depth about the 2016 great venture and we have so much in common especially handling the grief of loved ones and assisting local charities whenever possible. I (SOS Group) did not have to think twice when the opportunity arose to assist Mark on the 2016 venture and become major key sponsor. We have some great ideas for the long term and achieving the ambitious fundraising targets Mark has set. I have even set myself a target to run the full distance on one of the days during the 2016 run. And at 18 stone that isn't going to be easy!". I'm very grateful to all of my sponsors and it's great to add SOS Group Ltd to the list of growing sponsors and supporters of the run in 2016. *From the SOS Website - SOS Group are an independent supplier of photocopiers and multifunctional devices, with the ability to provide customers with a multitude of superior copy/print devices, we do have preferred suppliers that we recommend, call us anglethese photocopiers and multifunctional products are of the highest grade and offer the end user reliability and functionality. **All of my running events, up to and including the run across the USA in 2011, were paid for out of my own pocket. I couldn't afford to fund another event, so the USA was always going to be my last charitable run. However, £105,233 was raised as a result of that run and I felt that I owed it to the 2 charities to try and have another go at raising £50,000 (my original USA target) in Australia in 2013. The run across Australia would simply not have been possible without the backing of commercial sponsorship which was used for flights, RV motorhome hire, fuel, insurance, nutrition products and kit. Through some incredible generosity, that run saw another £56,126.60 raised for charity. Last week I reported that recruitment for the 2016 Support Team had begun with Carlton Fletcher signing up for what will be his 3rd stint of duty after runs across the USA and Austrailia. This week I'm pleased to report that Jason Stobbs (pictured below) has agreed to support me during the 2016 run. 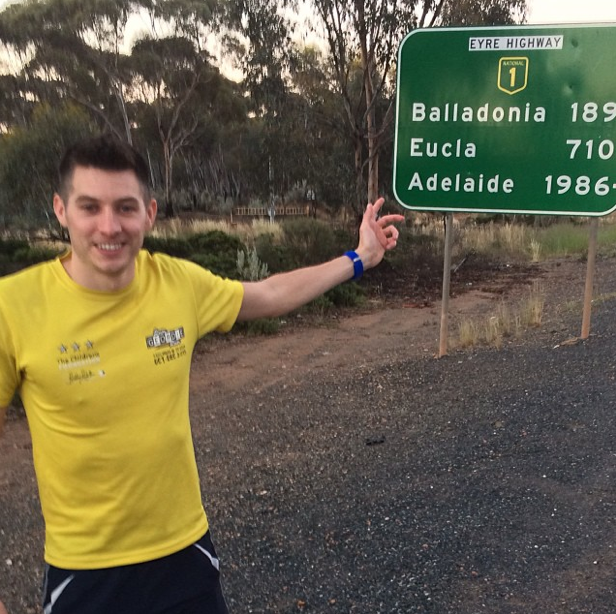 Jason is a Sports Therapist and was a huge asset on the team in Australia for 3 weeks on the Nullarbor. Jason and I agreed that, given the task ahead in 2016, we will have to make use of his services in a timely and prudent fashion. I get the feeling that the 2016 run is going to become very tactical and Jason's time on the team will be a big part of that. As well as his driving and Sports Therapy skills, like Carlton, Jason brings a wicked sense of humour to the team. It was humour that got us through 3 weeks in the Nullarbor. I did tend to take the micky out of him a lot in Australia but it served as the foundation for some brilliantly funny but very tough times. 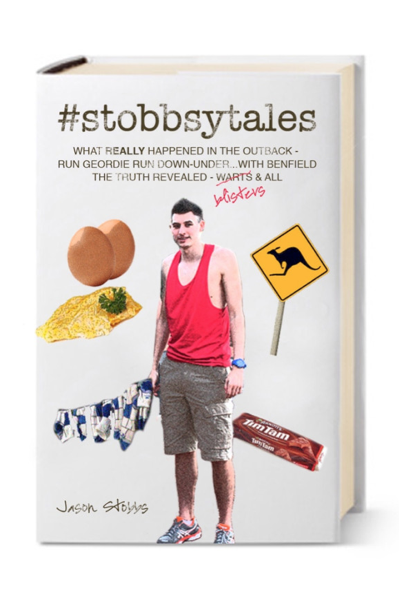 The #stobbsytales hashtag became popular on Twitter. It was used to highlight some of the trivial yet amusing goings on as we crossed the Nullarbor. "Half marathon done. Deficit down to 92 miles. Time for one of @jasonstobbs omelettes." "@jasonstobbs thinks this could be "the best omelette yet." #stobbsytales"
"I'm letting @jasonstobbs use some of the eggs to make an omelette for himself. I'm not normally this generous to the team. #stobbsytales". "@jasonstobbs omelette is sticking to the pan. "Oh, I'll just have scrambled egg then". #stobbsytales". 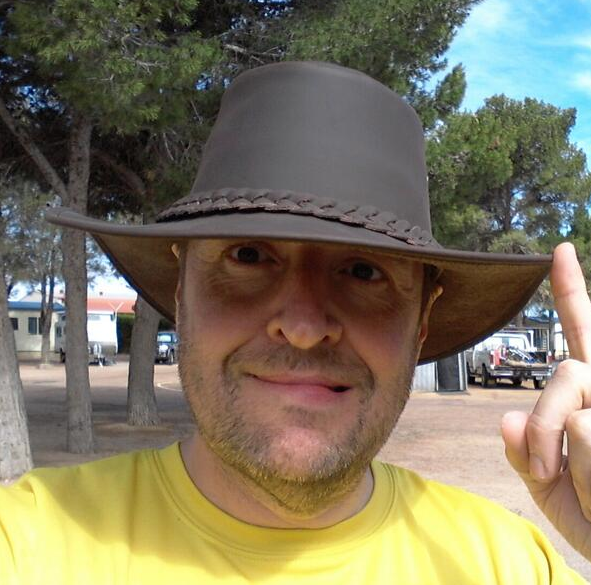 Jason had the following to say about signing up for 2016: "Stobbsys back! I didn't want to let the public down as I knew everyone wants more #stobbsystales so when asked if I would support on the next run I couldn't say no! On a serious note I loved supporting Mark in Australia as hard as it was (maybe not as hard as running across a country, but nearly!) I learnt a lot supporting the last time and will take all that experience with me and hopeful do as good a job if not better!". Thank you to Jason for again agreeing to give up his time in support of the 2016 run and the 2 charities. I'm sure you will agree, that the 2016 campaign has got off to a flying start. Progress with the acquisition of commercial sponsors and recruitment of support team members has been brilliant. I'm going to be telling the world exactly what my plans are on Wednesday morning. I'm going to be doing that with a lot of confidence and also the realisation that there is another long and difficult journey ahead. Following recent announcements about the growth of my commercial sponsorship base (Cherry Active, Chapman Ventilation and Sport Newcastle) and the 2016 Support Team (Carlton Fletcher), I received some further good news today. I'm pleased to reveal that The Cradlewell Clinic will once again be providing much needed clinical help and expertise for the in 2016. 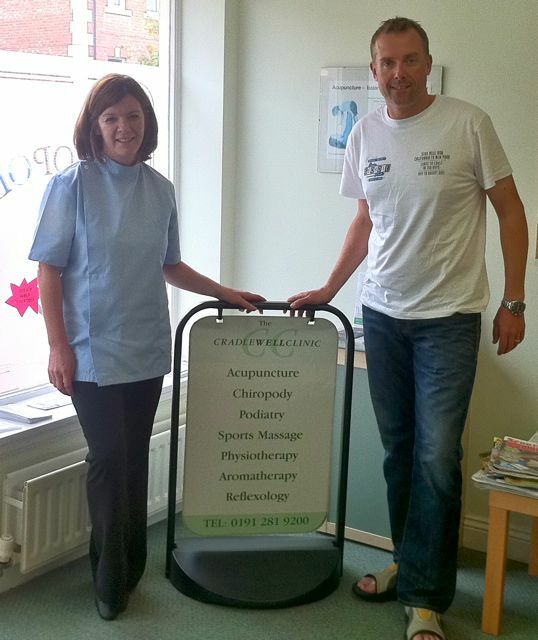 Alison Meldrum, the podiatrist at the clinic (pictured with me below), was responsible for bringing my feet back to full health after both the run across the USA in 2011 and Australia in 2013. Alison is well known to the running community in the North East. She has diagnosed and fixed countless running injuries and ailments over the years in her well established clinic located in Jesmond. She will not only be putting right any damage caused in 2016 but will be taking preventative steps before the event to make sure that we do not see a repeat of the horrific state of my feet while in Australia. Given the huge mileage ahead, it's safe to say that Alison has her work cut out! I genuinely mean it when I think that I'm in some of the best hands in the business. I don't think it's any exaggeration to say that the chances of success in 2016 are increased 10 fold thanks to Alison at The Cradlewell Clinic. All of my running events, up to and including the run across the USA in 2011, were paid for out of my own pocket. I couldn't afford to fund another event, so the USA was always going to be my last charitable run. However, £105,233 was raised as a result of that run and I felt that I owed it to the 2 charities to try and have another go at raising £50,000 (my original USA target) in Australia in 2013. The run across Australia would simply not have been possible without the backing of commercial sponsorship which was used for flights, RV motorhome hire, fuel, insurance, nutrition products and kit. Through some incredible generosity, that run saw another £56,126.60 raised for charity. There has been so much incredible support of Run Geordie Run and the 2 charities via commercial sponsorship to date. It continued today with Sport Newcastle becoming the 3rd sponsor to back me for the 2016 run. Now a registered charity, "Sport Newcastle was created from the former Newcastle upon Tyne Sports Council and offers funding and support to men, women and children seeking to realise their sporting dream.". As was the case in Australia, Sport Newcastle's funding will allow me to buy the kit that I will be using during the run in 2016. The Sport Newcastle logo can be clearly seen in the image below during the final few moments of the 3100 mile run across the USA. It will be a privilege once again to carry the logo on my shirt over the thousands of miles that I'll be running in 2016. I'm not the usual kind of "athlete" supported by Sport Newcastle. I am therefore very grateful for their support which allows me, in turn, to attempt to raise thousands for charity. Sport Newcastle said "Sport Newcastle are delighted to be able to support Mark on his 2016 challenge. 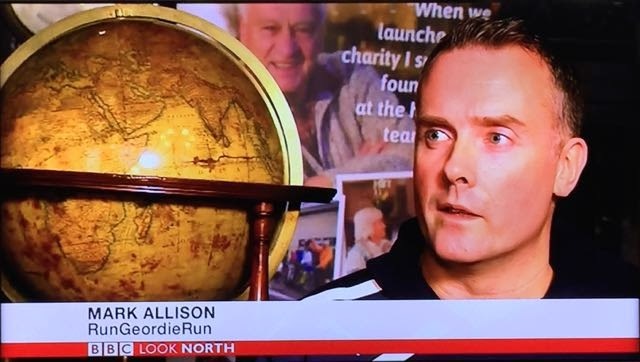 Mark is such a fantastic ambassador for the North East and once again we are proud to be associated with him. 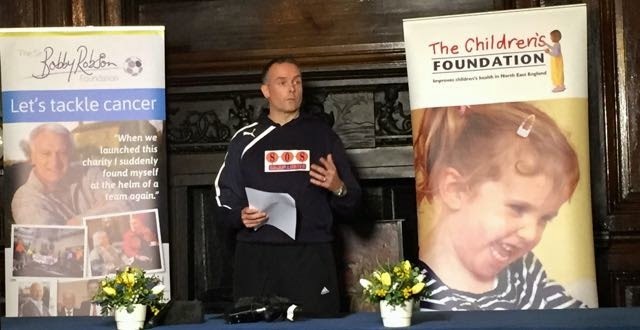 Everybody at Sport Newcastle wish Mark all the very best of luck in his 2016 endeavours and we are sure that two great causes in the Sir Bobby Robson Foundation and the Children’s Foundation will continue to benefit from his efforts.". Sport Newcastle have now joined Chapman Ventilation and Cherry Active as sponsors for the run in 2016. The commercial backing that I've received so far is helping to lay the foundations to make the run in 2016 another success. Together, we are within touching distance of raising a quarter of a million pounds for good causes in the region. The announcement of the 2016 run is now less than 2 weeks away. Invites will be sent out to the media and sponsors next week to attend a very special announcement event in a very special venue. These are very exciting times for me and I'm looking forward to sharing the details of what promises to be another amazing and unprecedented fundraising event. The man who once said "never again” after supporting my run across the USA and subsequently went on to support my run across Australia has signed up for a 3rd stint on the Run Geordie Run support team for the 2016 run. I'm absolutely delighted to announce that Carlton Fletcher, pictured below during the run across Australia, will be supporting me once again. Carlton brings a wealth of support experience and, arguably more importantly, a tremendous sense of humour to the team. He knows exactly how I operate, what my thought process is and what motivates me during these major endurance events. Carlton is a very innovative quick thinker and not a bad cook, photographer, mechanic and driver to boot. It is these kinds of attributes which have helped us get out of many difficult situations in the USA and Australia. To this day, I don't know how he managed to get a 36ft motor home through the busy roads of New York to the finish line at Coney Island in 2011. Carlton knows how to operate an RV motor home and can be seen below using the last of the water to do the dishes when I needed a shower! As I said, he has a tremendous sense of humour! Oh how we laughed in Australia when I hadn't showered for 4 days. We had very clean dishes though! Carlton's skills don't stop there. Over the years he has been involved in supporting my fundraising activities too. He has been responsible for raising thousands of pounds for the charities since he has been on the support team. 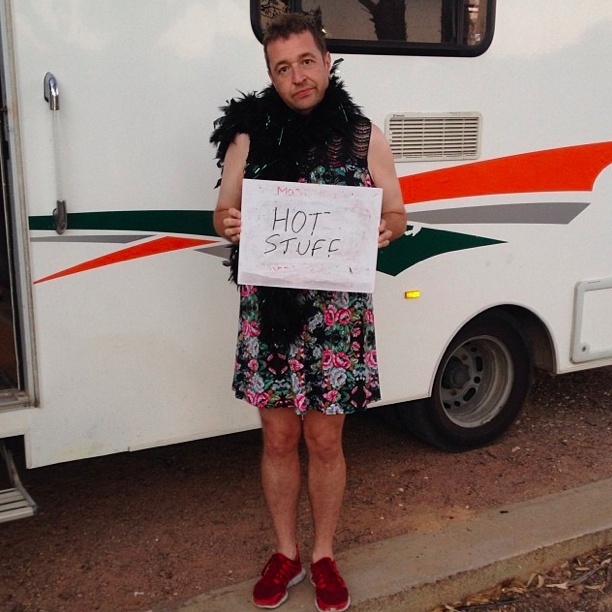 His last fundraising efforts saw him "dress up" and run a marathon on one of the scorching hot days in Australia. He raised £1300 for the Sir Bobby Robson Foundation and The Children's Foundation as a result. I dread to think what he might do in 2016! There are many funny stories that I could add about Carlton's time on the Support Team but that would probably be for a book rather than a blog post. In the meantime, Carlton's account of the final hours of the run across the USA can be seen here. When pushed for comment Carlton said that I could use one of the following quotes. I've published them all for completeness! "He makes me do it. He also takes my dinner money." "Helping mark, is like helping a small needy child." "Despite saying I would never do that again, the reality is I just can't get enough of it." "What Mark does is inspirational, and helping him fills me with warm happy feelings." "It gets me away from the family for a couple of weeks." "It's a small sacrifice to help the enormous sacrifice that Mark makes for such brilliant causes." "It's truly satisfying to help Mark make a difference. 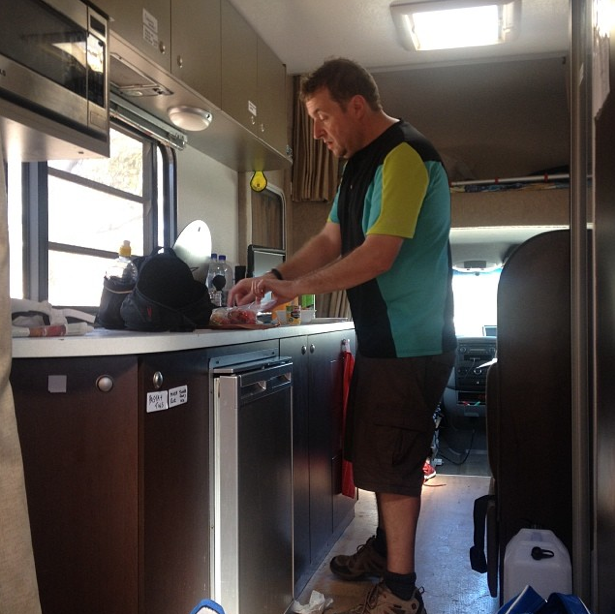 The difficult living conditions, continual abuse, pain and suffering that the support team face for a couple of weeks, pales into insignificance compared to the good that Mark's chosen charities bring to ordinary people on a daily basis." Whatever his reasons for his amazing continued support, I'm very grateful to Carlton for volunteering his time and money to help the 2016 run become a success. And that, at the end of the day, is exactly what he is; a volunteer. He spends time away from his family (I've not heard them complain yet), pays for his own flights and accommodation and is a member of a team making a huge difference to the local community. Without such volunteers there would be no running down the UK or across the USA or Australia and no charitable funds raised. Thanks Carlton! I'm very pleased to report that Chapman Ventilation will be joining the recently announced Cherry Active as a sponsor for the next major run in 2016. Regular readers will be aware that both of them are former sponsors and were hugely supportive during the run across Australia in 2013. Chapman Ventilation are "one of the UK's leading HVAC contractors for the restaurant industry. With clients such as Nando's, Jamie's Italian and Hawksmoor". During the run across Australia they were the sponsor of the daily weather updates (shown below) seen on the Run Geordie Run Facebook, Instagram and Twitter pages. 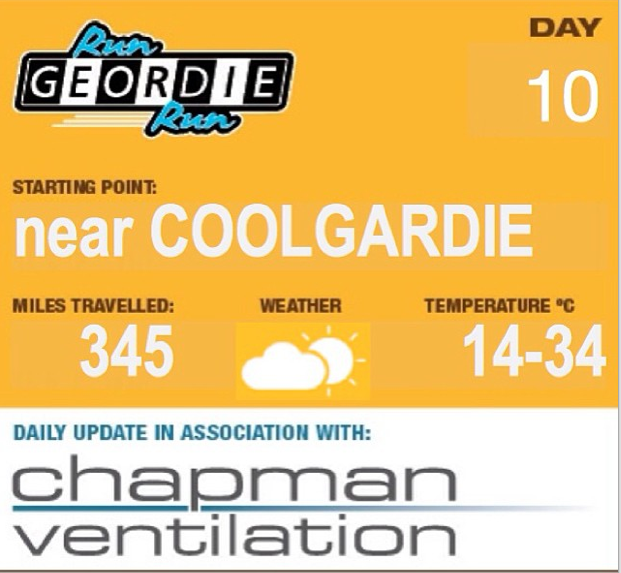 I'm aware that Chapman Ventilation do a lot of good charity work within the company already and I'm very grateful that they have chosen to continue their support of Run Geordie Run, The Sir Bobby Robson Foundation and The Children's Foundation. A couple of years ago, together with their sister company Sirius Products, they supported Sir Ranulph Fiennes and his team in their attempt to cross Antarctica on foot during Winter! They "designed, developed and fabricated stainless-steel sinks, urinals and glove racks for use throughout the expedition, all of which required significant planning and research in order to develop a product able to withstand such extreme conditions.". Chapman Ventilation had the following to say: "Here at Chapman Ventilation, we are consistently taken aback by Mark's determination and the lengths he's gone to to raise money for such worthwhile causes. Just the thought of flying across Australia is enough to tire us out. Because of this, and because David and Anthony Chapman are both stalwart Newcastle fans, we're delighted to announce that we will be sponsoring his 2016 challenge. Good luck Mark, we'll be rooting for you! ". I'd like to say a huge thank you to David and the kind folks at Chapman Ventilation for their continued support. Without it, just like the support from Cherry Active, there would be no run in 2016 and no shot at reaching the 1/4 million pound milestone for local charities. It is no exaggeration to say that hardly an hour of my waking life goes by without someone asking me what the location of the next run is. There have been many guesses and some people have been close to the exact location recently. 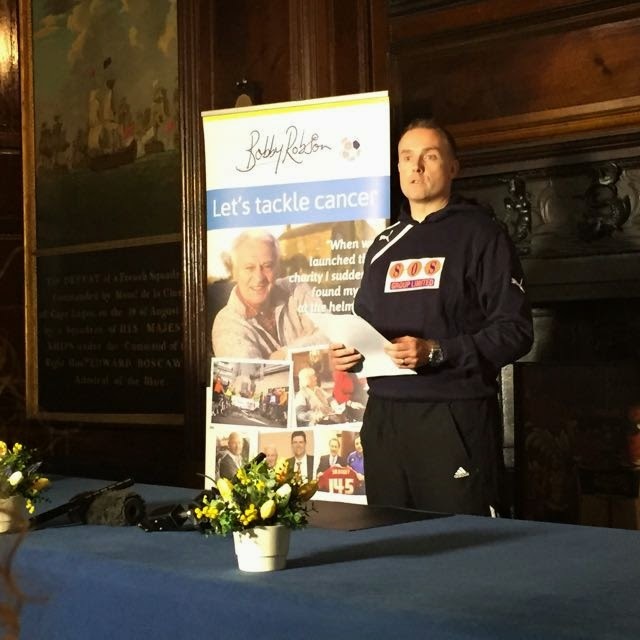 The announcement of the location of the 2016 run in aid of The Sir Bobby Robson Foundation and The Children's Foundation will be made during the week commencing the 13th of October. I visited a venue in Newcastle this week and I'm hoping to get the go-ahead next week to use it to announce the details of the 2016 run. The media, my sponsors, the charities and various key people will be present at the event. Inevitably, the exact details of the announcement will hit the internet, TV and papers soon thereafter. It's a very exciting time indeed. Leave your guess in the comments section of the daily picture clue. LIKE and SHARE that day's daily picture clue. You are allowed only 1 guess per daily picture clue. You must LIKE the Run Geordie Run Facebook Page when the competition closes at 8pm on the 16th of October. So a few simple rules should see one clever winner with the new Run Geordie Run 2016 t-shirt. So, what are you waiting for? Head on over to the Run Geordie Run Facebook Page and have a go.